Lording it over the old town from the peak of a craggy granite ridge is the derelict palace of the 16th century ruler Sengge Namgyal. 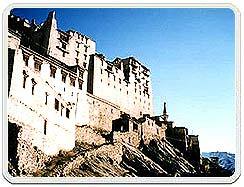 A scaled down version of the Potala in Lhasa, it is a textbook example of medieval Tibetan architecture, with gigantic sloping buttressed walls and projecting wooden balconies that tower nine storey above the surrounding houses. Since the Ladakhi royal family left the palace in the 1940s, damage inflicted by 19th century Kashmiri cannons has caused large chunks of it to collapse. Bring a flashlight, and be careful while walking in spite of restoration work, holes gape in the floors and dark staircases. Catch The View From The Top! Apart from the flaking murals that decorate the ruined royal apartments and staterooms on the upper levels, very few remnants of the palace's former splendor survive. 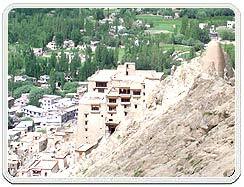 The main reason to pick one's way through its gutted interior is to reach the roof terrace, which offers spectacular views over the mud brown rooftops of the old town to the wrinkled flanks and snow covered ridges of the Stok Kangri Mountains. Also worth a look as one passes is the Dukhar temple on the fourth storey. The gloomy shrine, whose centrepiece is a thousand armed image of the Goddess Tara, houses eerie masks, musical instruments and weapons - props for the recitals and religious ceremonies once held in the courtyard outside.